The article deals with the contemporary issue of evaluating contemporary designs in historical context. Many times such projects do not succeed, but what might be the reason(s) for that? Besides describing a specific case study of a Hungarian building’s history and structural transformation, the article aims to analyze some of the possible reasons of the project’s failure to point out useful general recommendations and to propagate further discussion about the diverse options of revitalizing historical architectural sites. Change is essential to sustaining heritage sites, enabling them to meet new uses and evolving expectations, goals, and requirements. Rehabilitation for reuse is one of the steps to be considered in order to safeguard architectural heritage. In this context heritage means only something from the past without any connection to UNESCO’s  or the European Commission’s  heritage notions and institutions. The category of architectural heritage, including both buildings with defined cultural heritage and the ones that are worthy to save for next generations due to their historical-documentary or artistic value, is a comprehensive set of buildings and consequently it is a considerable variety of characteristics, values and constraints. Accordingly, the existing building is seen as a container in which new units should be placed that are defined by contemporary lifestyle. In a process of proper protection and conservation there is an ongoing challenge to search for balance between structure and shape or old and new. The aim of this challenge is to respond to the needs of modern men and women in the limits of the existing structure. For this reason many questions have to be asked and discussed regarding for instance the management of economic sustainability, integration and hybridization of uses as well as absorption capacity or compatibility. The present case study introduces the most recent phase in the life of a historical building on one of the liveliest street of the Hungarian capital, Király utca (King Street). The building had been in a very bad condition due to the destructions in World War II and the neglect since then. A private company bought it from the municipality in 1999 and got transformed to a multicultural building complex. The grand opening happened in 2007 and it operated successfully at the beginning. More than a year ago, in January 2015 it got closed down and has been stayed closed and empty since then. It is unquestionable that there are multiple effects, human falls and outside circumstances that together lead to such a tragic end of an initiative and the building but such storyline is unquestionably not unique hence it is worthy to investigate it thoroughly to find out and to propagate the prevention of these causes in the future. The building had been designed in 19th century by one of the most outstanding and well-known Hungarian architecture of the time, József Hild. It is a four-floor building located on 11 500 square meter base situated in today’s downtown in the center of the newly prospering 5th district on the Pest site of the Hungarian capital. At the time of its construction this area had been just outside the city near to its border and closed to the main market. The owner of the building had been András Ferenc Jálics, wine merchant and the building had been the center of the Hungarian Royal Winery. Accordingly the original function of the structure had served multiple aims. It had been the home of the owner and his family, the enormous basement system (where carriages could have easily turned around) arranged in order to properly store different types of wines in big quantity and a shop located on the ground floor. Technical innovations such as the regulation of air in the storage system had also been adapted to the building for the structure to fulfill the functional needs. The same family with the same business owned the building until the mid-20th century when the state eliminated private property. A significant interval came in the history of the building when it did not have any thoughtful owner. 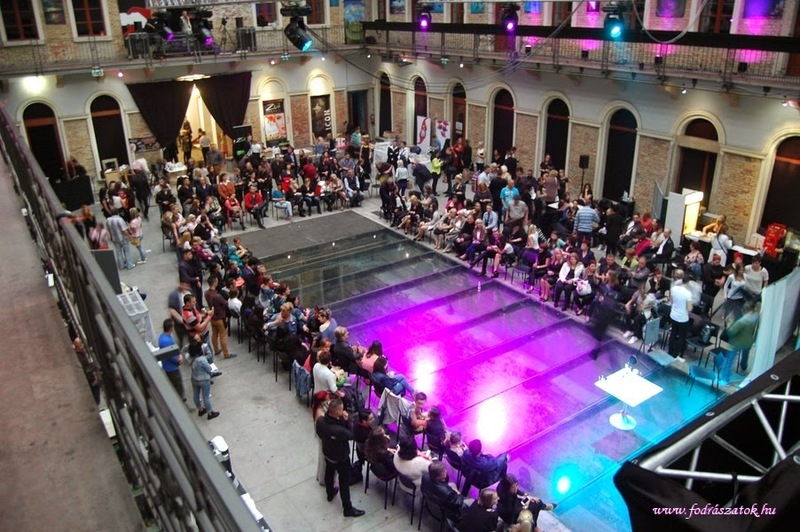 In 1999, Miklós Vincze the owner of VAM Design Ltd. bought the building that was already protected partly as a monument, which decreased the possibility of a total reconstruction. His aim, dated back to the mid-1980s, was to establish a relevant location for modern art, where the consumers, the merchants and the artists could interact. As he phrased it he saw the project of reconstructing the house and establishing this new initiative as one project, where he aimed to sell or market the feeling of modern design. Similarly, he dreamed of a connecting education initiative called VAM Art Projekt, which was planned to be an intensive and multilayered two-year program for contemporary, which required the establishment of studios and a library area within the reconstructed architecture. Vincze at that time was a very successful design merchant, who was able to realize a project with the yearly planned budget of 275 million Hungarian forints (more than 870 000 Euro). The reconstruction work took eight years meanwhile the ownership was given to another Ltd and the VAM Design only rent the building and lend its sections further to other companies (such as printing, design or other companies) and to artists (as studios). The new structure had approximately 30 office or studio sections, a big (for 600 people) and numerous smaller exhibition or event locations (for 250 people each) and shopping areas on the ground floor facing towards the street. The original brick coverage and the structure of the basement system were kept as well as the façade and the main staircase were renovated with original techniques and materials as these sections of the architecture are under monument protection. Accordingly, the cables and wires that would serve the new infrastructure and modern technology could not be hidden in the walls but on them. The most visible change happened in the center courtyard that was covered on the top and opened up on the ground towards the basement with glass and steel structure. Major changes happened on many other parts of the building as well such as in the territorial structure of the upper floors and in the back side of the building that was almost totally bombed in World War II. At the design phase of the reconstruction, it was a very important aim to visibly distinguish the new parts from the original ones that is why for example they used concrete instead of brick in case of the new added parts and established a panoramic elevator too that stands out from its context even for the general visitors’ eyes. The building served the aim of the multifunctional institute that combined the heritage of the architecture and the possibilities of contemporary materials and methodologies to establish an inspiring location. Since its grand opening that was covered in the media vividly diverse events were organized here such as gala dinners, charity occasions and fashion shows, conferences and fairs. The building hosted numerous traveling exhibitions as well such as the Body and Body Two blockbusters. The managing company had its own contemporary applied art and design collection of more than 130 pieces that could be visited with the art works of the artists in residence. The suitability of the new structure to its function can be best exemplified with a photo exhibition titled Dialogue organized here in 2008. The artistic concept of that event was to let the viewers wondering around without any guidance to establish his or her unique dialogue with the exhibited items and to formulate his or her understanding about the conversation the projected images had with each other. These very flexible and relatively big spaces were perfect location for this aim. The envisioned and firstly very successfully realized project was clearly new and unconventional, which led to many questions or critiques. For example the seemingly successful Maya exhibition in 2012 was harshly criticized by experts for not being interactive or informative despite its marketing message. Another aspect of the uncountable criticisms and questions was regarding to the quality maintenance in the education of artists. The fact that the educational program promised international success to the participants within two to three years comparing to the general assumption of the necessary two or even more decades made the related groups doubting. Also the fact that no accepted art historian and or contemporary art specialists was invited to neither the application nor to the teaching phase made the whole project rather mysterious for the professional audience. Similarly, the first exhibition of these selected and educated artists was not an overall success at all, which again justified the negative assumptions of this project. A direct attack or artistic question was formed about the education program with a contemporary public art performance on the façade of the building in 2008. 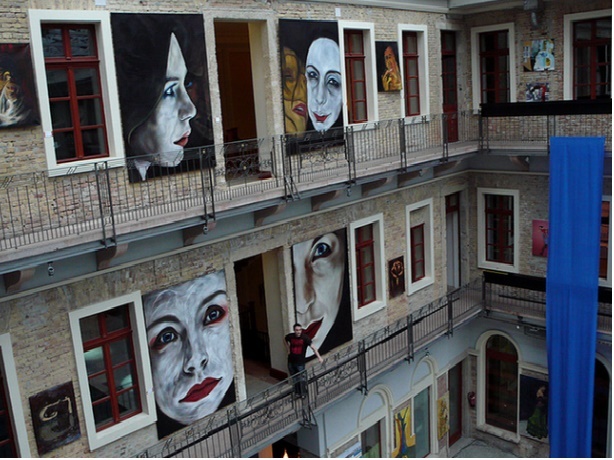 After the promising and largescale aims of the education program were announced, a contemporary art professor and media artist, János Sugár painted graffiti on the façade of the building. That was a copy of his art piece that was also exhibited in the Contemporary Art Gallery at that time and was a text saying: Wash your dirty money with my art. There were two major issues with this performative act. On one hand, Mr. Vincze, who previously named himself as the new supporter of contemporary art, furiously reacted to this action and went on court for revenge, which questions his knowledge and understanding about street art. On the other hand, there was a major misunderstanding in the translation of the text. Many saw it as an accusation against the project of its assumed illegal financial actions, while the artist himself wanted to raise a more general question about financing contemporary art with not artistic reason. The already questioned and many times targeted VAM Center experienced a significant decrease of its status as a contemporary art and design supporter after this event. Many questions were also raised about the financial compatibility of the project. There were plenty of rumors that the managing team focused more on serving the aims and needs of the companies, who rented out the architecture or a part of it for certain events than to the protection and respect of the collected and exhibited contemporary art pieces. Financial problems, unpaid rent fees and other news were circulating from 2014, moreover the last exhibition called Empires of Cubes had to be closed down after a month and it was re-exhibited at a new venue so the previously bought tickets could be validated there. The last phase happened in 2015, when the building was evacuated following a judicial decision and it is empty and human-less since then. The huge poster advertising the last exhibition and its planned connecting events is still on the façade of the building, but neither the homepage of Vam Design, nor the given mobile numbers are operating anymore. During the conservation of architectural heritage functional and architectural compatibility is considered in order to incorporate pre-existing elements. In fact the concept of compatibility involves actions aimed at uniting several pre-existing and new elements without creating negative fallout. This task was solved perfectly in the given example. The only questionable element was the storage of the art pieces and some exhibition areas such as the corridors that were not wide enough for enjoying the art from a necessary distance. Moreover, at certain occasions such as at gala dinners these art pieces were seen especially not protected. It is crucial to ensure that the chosen function is ‘culturally’ compatible with the building in question and does not involve changing the heritage. As functional organization has the potential to change the way architecture is experienced and the discontinuity and segregation of activities within a structure can ruin its cultural significance. Historic buildings are characterized by the inseparable relations between form, structure, material and function, which define both their architectural identity and cultural significance. Change may be necessary, but is undesirable, where it reduces cultural significance. The emphasis paid on the revitalizing the basement system might allude to the fulfillment of the above described requirement. Especially the intervention of opening up its ceiling towards the main inner courtyard could help to serve the new function that territory, as exhibition area. The essence of the new design approach is that the new must revitalize the old by creating a new function with a modern image in order to accommodate the changing and current needs of the users. In short, the benefits extend far beyond the conservation of the building from the past. The complex theme of functional update requests considerations for not to degrade the historical, cultural and aesthetic values of the architecture. The context (meaning the new use) determines its forms to a certain extent, similarly to what Joseph Maria Olbrich, the Austrian architect and co-founder of the Viennese Secession, chose as a motto on the entrance of the Secession Building in Vienna: “To every age its art and to art its freedom.”  If we understand the alluded wholeness of the building where the original, historical elements and the new additions have same significance and relevant roles, we need to take into consideration the structure’s connections within the urban structure too. Such more holistic approach would open up more than one problematic aspect. Keeping the historic façade of the building ensured the continuity of the street view and it was also necessary due to its protected status however it can be seen as a negative effect by not marking the new function of the building. It did not stand out from the chain of buildings hence it did not invite in the general public not even the huge posters hanged outside grabbed enough attention. Similarly, the street and the area became the party district of the town that changed the main visitors of the street. The street with the uncountable number of bars and the impossibility of park with cars were not suitable for the companies renting offices at the researched building neither for the guests of the envisioned high-profile events. It is the younger generation, who should have been targeted to enter and use the new institution. It can be safely said that besides the insufficient financial management and the neglect to involve the related interest groups the main reasons that resulted in the failure of the project were not considering the circumstances and the changes in the neighborhood. While identifying compatible use or uses for a historic building, functional continuity needs to be evaluated as one of the basic design criteria in order to retain their cultural significance. This is because a historic building can fully reveal its potentials only if it is experienced and evaluated as a whole. All in all, restoration has to preserve the authentic character of the architecture and its historic stratifications like the main staircase of the building, while it also must make the new structure distinguishable and suggest a compatible use, which was also possible with the adaptation of concrete. The clear concrete surface of the new elements was similar to the historic parts in its simplicity and adaptability to create diverse atmospheres with art or other design elements. Hence it can be concluded that the main problem was not with the chosen architectural solution to modernize the historic building. It is crucial to keep in mind that architectural elements are part of the urban structure and any kind of rehabilitation should happen within its physical and social context. Nieves, M., Casado, S. “The Fontecha y Cano flour mill. Restoration and new uses.” in Palmero, L. ed. ReUSO. Valencia: ByPrint PercomS.L. 2015. CD-Rom. About the heritage definition of UNESCO World Heritage Convention: http://whc.unesco.org/en/about. About the heritage definition of the European Commission: http://ec.europa.eu/programmes/creative-europe/actions/heritage-label/index_en.htm. Marconi, P. “The way it was or the sudden passion for regional restoration and the Italian architecture.” Richerche di storia dell’arte. 1996:60. p. 7-32. Baiani, S. „Near Zero Energy Historic Building. Tools and Criteria for Ecocompatible and Ecoefficient Conservation.” Conference Proceeding on the International Conference on Energy Efficiency on Historic Buildings. Madrid: Fundación de Casas Históricas y Singulares y Fundación Ars Civilis. 2014. p. 326. Lacaton, A ., Vassal, J. P. „Beyond the Loft.” in Baum, M., Christiaanse, K. at all. City as Loft. Adaptive Reuse as a Resource for Sustainable Urban Redevelopment. Zurich: GTA Verlag. 2013. p. 41. Turco, M. G. „Architectural harmonies: A sought-after compatibility.” in Palmero, E. ed. ReUSO. Valencia: Percom S. L. 2015. CD-Rom. Stephan, R., Beil, R. eds. Art to Hear: Joseph Maria Olbrich. Berlin: Hatje Cantz Verlag. 2010. Ricci, M. „Stone as a Determinant of Architectural Identity in The Florence of Renaissance.” AIZ ITU Journal of the Faculty of Architecture. 2012:2. p. 121-134. Baiani, S. “Near Zero Energy Historic Building. Tools and Criteria for Ecocompatible and Ecoefficient Conservation.” Conference Proceeding on the International Conference on Energy Efficiency on Historic Buildings. Madrid: Fundación de Casas Históricas y Singulares y Fundación Ars Civilis. 2014. Lacaton, A., Vassal, J. P. “Beyond the Loft.” in Baum, M., Christiaanse, K. at all. City as Loft. Adaptive Reuse as a Resource for Sustainable Urban Redevelopment. Zurich: GTA Verlag. 2013. Nieves, M., Casado, S. “The Fontecha y Cano flour mill. “Restoration and new uses.” in Palmero, L. ed. ReUSO. Valencia: ByPrint Percom S.L. 2015. CD-Rom. Ricci, M. “Stone as a Determinant of Architectural Identity in The Florence of Renaissance.” AIZ ITU Journal of the Faculty of Architecture. 2012:2. p. 121-134. Turco, M. G. “Architectural harmonies: A sought-after compatibility.” in Palmero, E. ed. ReUSO. Valencia: Percom S. L. 2015. CD-Rom. UNESCO World Heritage Convention: http://whc.unesco.org/en/about.